The Orange OMEC Teleport makes it easier than ever to combine digital software/app models with pedals and amps in your performance rig. Any guitarist who has tried to combine computer software or mobile device apps with a traditional live performing rig (i.e. genuine amps and effect pedals) probably knows that while it can be done, it also can be a lot more complicated than it needs to be. Orange’s new OMEC Teleport audio interface greatly simplifies the integration of software/apps, within an existing rig, by providing guitarists with a stomp box device that easily fits on a pedal board, converts analog audio to digital and vice versa, and connects directly to a computer or mobile device via USB. When you want to access sounds or models from your software, you simply engage the footswitch. You can also use OMEC Teleport as an audio interface for recording directly to digital audio workstation software. FEATURES The “micro” pedal design of the Orange OMEC Teleport is truly as simple as it gets. There is a ¼-inch input jack, two ¼-inch output jacks for stereo output or sending signals to two different signal chains, a USB jack and a 9-volt DC center negative plug for a 2.1mm power supply plug (a power adapter is not included, but the unit can be powered with any standard 9-volt adapter or power supply). That’s it. There are no knobs to adjust as all settings, such as output level, are controlled within the software or app itself. 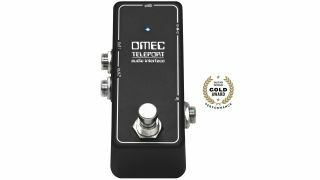 The super compact size means that OMEC Teleport can easily fit into a crowded pedalboard. The package also includes a free download of IK Multimedia’s AmpliTube CS app (for Mac OS/PC) that provides models of four Orange amps and cabinets and seven stomp boxes. The app also has a loop drummer and single-track recorder. PERFORMANCE Thanks to its true “plug and play” design, using OMEC Teleport couldn’t be any easier. Just connect a guitar or a pedal’s output to the input, connect the output(s) to an amp or other pedal in the signal chain and connect the USB jack to your computer (an optional cable is necessary for connection to an Android or iOS mobile device). Since I have so many unique pedals that haven’t been modeled yet, I particularly enjoyed placing OMEC Teleport at the end of my signal chain and using it to incorporate amp models from various apps into my rig. Even cooler was being able to blend my “real world” amp with modeled amps sent to sound system to create massive, complex tonal textures. ● The USB jack connects directly to a computer without needing any drivers or further setup for true plug and play recording. ● The “micro” stomp box design allows guitarists to add digital models to their standard rig with the ease and simplicity of adding a new stomp box to a pedalboard. THE BOTTOM LINE The plug and play stomp box design of the Orange OMEC Teleport makes it easier than ever to combine digital software/app models with pedals and amps in your performance rig, as well as to record digital audio with no fuss.